The Defender® Ridge Spike is a specifically designed bird deterrent for use on the ridge tiles at the top of roofs. Birds such as pigeons and seagulls love to perch on the highest point available to view the best feeding sites and be aware of any potential predators. This makes the ridge tiles of a home the perfect perch. The base of the roof spike has been shaped into an upside down "V" to fit snugly over the top of triangular ridge tiles. The roof spikes have extra long pins that stop not only birds such as pigeons, but also larger birds like seagulls from landing on roofs. They therefore prevent the birds from fouling and roosting on your home and business. All our stainless steel bird deterrents are made by us, Jones and Son Pest Control Supplies in Devon. Please do pop into our warehouse to chat with our friendly advisers and see how our spikes are individually made. 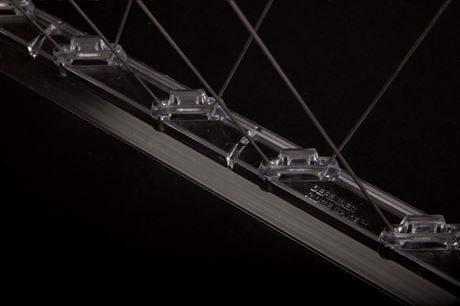 Defender® Ridge Spikes have 2 rows of stainless steel pins that fan out to give a ledge protection of 27.5 cm or 11 inches. 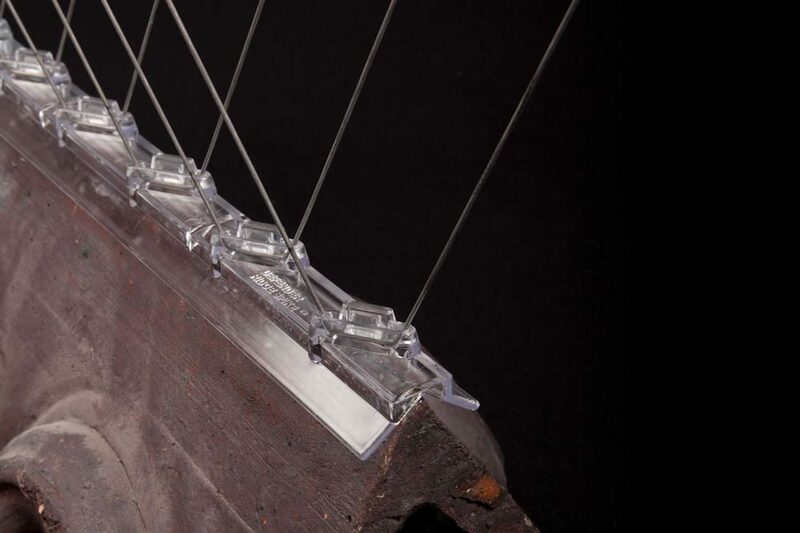 With this angle of pins, the bird and seagull ridge deterrent will stop birds landing on roofs. The length of each Defender® Roof Spike is 33.4 cm long (13 inches). To cover a 1 metre long section of ridge tiles, 3 strips would be necessary. The average terraced house has a roof length of 5 metres. Therefore 15 ridge tiles would be ample to stop birds from landing on the roof. All Defender® Stainless Steel Bird Control Products are humane and recommended by the RSPB. The ridge spike pins make landing uncomfortable for seagulls and other birds, without injuring them, which means they move on to other more accessible areas. The pins themselves are extra long so cater not only for pigeons and other similar sized birds, but also for the seagull with longer legs. The Defender® Stainless Steel Ridge Spike has 2 rows of 15 cm (6 inch) long 304 grade stainless steel pins. They protrude from the UV stabilised polycarbonate base of the spike at 2 different angles. This spread of pins acts as a bird deterrent and stops seagulls and birds from landing on the apex of the roof. The Defender® Ridge Spike has a triangler base that will give a secure fit onto any apex roofing ridge tile. Simply glue the base of the ridge spike with Defender® Fixing Silicone, ensuring both faces of the underside are covered, and press firmly down onto the roofing tile. The angled base of the roof ridge spike means the bird spike can achieve a good grip with no slippage. 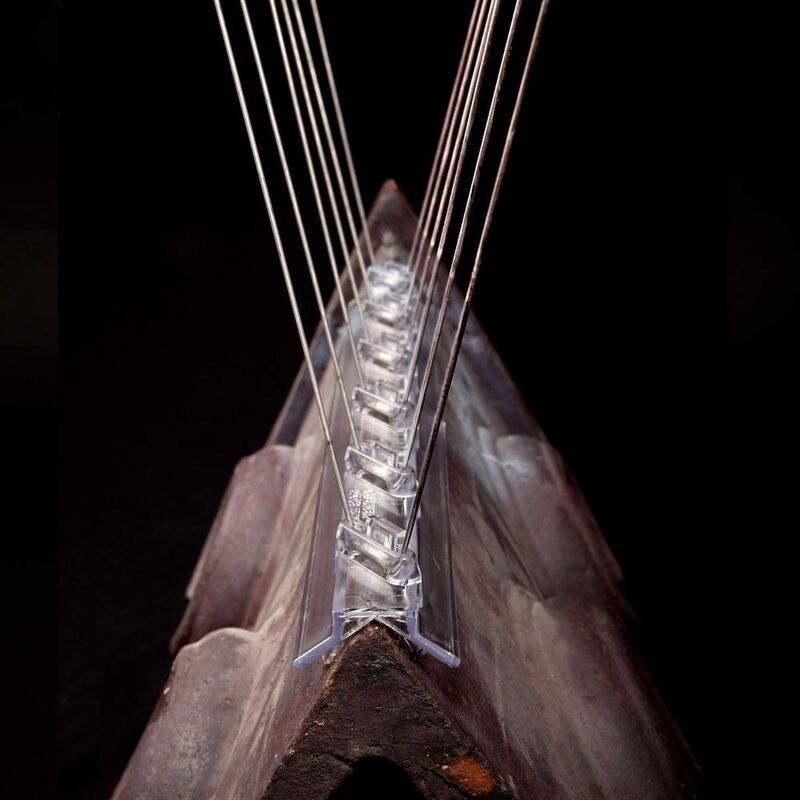 However, if your ridge tiles have a curved shape, there is no need to purchase the specially shaped ridge tile spike, but the standard Defender® 12 Bird Spikes can be used instead. Simply glue directly onto the top of the ridge tile. Click here to view Defender® Ridge Spikes - Installation Guide It is important to check the suitability of surfaces for use with Defender® Silicone. For more information, please visit the product page Defender® Fixing Silicone Adhesive Glue. The thick UV stabilised base is manufactured from Durolon polycarbonate plastic, which doesn’t succumb to brittleness or weather degradation. This, in conjuction with the 304 grade stainless steel pins, ensures that this high quality seagull roof ridge spike will last for years. For this reason it comes with a 25-Year “No Rust” Warranty. This high quality, UK manufactured pigeon and seagull spike has a 25 Year "No Rust" Warranty. This means the pins will not tarnish whatever the weather throws at it. The tough base is made from a super strong polycarbonate, ensuring that, once the roof spikes have been installed, there is no need to replace them for years to come. The householder therefore has complete peace of mind that their property will remain bird free. Defender® Ridge Roof Spikes are made in the UK, in Devon, using only the highest quality materials. Jones and Son Pest Control Supplies Ltd design and manufacture these high quality stainless steel bird and seagull ridge roof spikes. Husband and wife team, David and Kursty Jones, ensure all the Defender® Bird Control Products are not only high quality, but also long lasting and, most importantly, 100% effective. Although the installation of our Defender® Roof Spikes is easy (it really is a case of just applying fixing silicone to the base and pressing down into position) the nature of the product means that access can be difficult. If you are at all worried about using ladders or gaining access to high areas around the home, we would really recommend talking to a professional pest controller or property maintenance company. Full Length "Ridge Spikes and Seagull Spikes Installation Video Guide"
Our Defender® Steel Ridge Bird Spikes have kept thousands of birds and seagulls off the roofs of properties and homes in the UK and abroad for years. Read Defender® Ridge Spikes Reviews<. If you have a "How to stop birds landing on my roof ridge tiles" question, please contact us and we will be happy to help solve your pigeon or bird issue. (Mon - Friday 8.30am - 4.00pm). Please note: For every 24 strips (or part there of) that you order, we will automatically add one tube of fixing adhesive to your basket. Only our Defender® Adhesive is recommended as others may not stick to the base.